A dog is as nosey as a child, while a puppy is as unpredictable as a toddler. We all know Little Doggo just wants to have fun but sometimes his insatiable curiosity gets the best of him. That is why you need an indoor dog gate as a primary step to pet-proof your home. It is simply one of those pet-proofing must-haves. A dog gate serves as a barrier to keep your dog away from unwanted areas of your house; not only because you had an expensive vase standing near the doorway, but also because you don’t want him to run into electrical outlets, toxic chemicals, and sharp objects. There are also other reasons why you should get one. Since dogs are ever so curious, they always end up in dangerous places and have a knack for knocking things over. Dogs are analogous to playful, boisterous children; the only difference is that they leave a trail of fur and cannot understand your vernacular, so there’s no point scolding Doggo. An indoor dog gate allows your dog to freely roam around a room or series of rooms where he can resume his monkey business without destroying your furnishings, especially your expensive decorations. Confining your dog using an indoor dog gate is much healthier than crating him all day, as it allows Doggo some stretching and playful exercises. Instead of shutting your dog inside a room away from visiting guests, using an indoor gate allows you to keep the doors open to keep the air flow consistent throughout the rooms, which is particularly important if you use central air-conditioning or heating. Likewise, an indoor dog gate can serve as a training tool (along with treats) to help demonstrate your dog’s boundaries. The best dog gates don’t need major installment, no matter how wide or tall they are. Such are easy to use and store away. When you allow your dog to roam around, especially when you are convinced how housebroken your dog has already become, you can always take it down and set it up back again when you have another fur-baby to take care off. The Regalo Easy Step Walk Thru Gate is among the most popular walk thru dog gates on Amazon. This gate is suitable for use with stairs, hallways, and doorways. With its wall saver design, this dog gate requires the least possible effort for its installation; no tools required. You only need to choose where to place the gate and set it up using its pressure mount system; thus, it’s quick, easy, and guarantees your lovely wall free of any damage. From 29 inches, this dog gate can expand up to 10 inches more to fit a large entryway. It stands 30 inches tall, which is also good enough for small and medium-sized dogs. Its sturdy white metal frame ensures no band of rampageous fur-babies can whittle it down. Also, its spokes are only two inches apart and hence, no amateur escape artist can get through. We consider this model to be the top rated out of the best dog gates we are comparing in this review. What is more, the Regalo Easy Step Walk Thru Gate features a convenient lever handle and a one-touch release safety lock system. Such feature is expedient especially when you are carrying your puppy in one of your hands. You can easily unlock the gate by lifting the lever handle and slide it back again to keep the gate securely locked. How convenient! It is also great to know that this dog gate meets the safety standards of the American Society for Testing and Materials: which means the Regalo Easy Step Walk Thru Gate guarantees safety and quality for your fur-babies. This product is lightweight, portable, and stows flat; hence, you won’t have to worry about storage when it is time to take the dog gate down. So what makes this dog gate second best in our list? 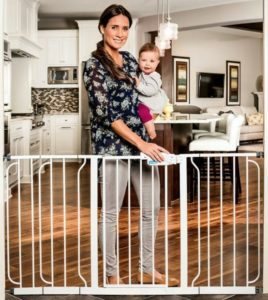 First and foremost, this gate shares some similar features with dog gate no.1, but the Regalo Extra WideSpan Walk Thru Safety Gate is specially designed to accommodate a variety of wide openings in larger homes such as corridors, archways, staircases, etc. This gate can expand from 29.5 inches onwards. It includes three extension kits measuring six, eight, and 12 inches, so you won’t have to purchase extra extensions when needed. With the included extension kits, this dog gate can expand up to 58 inches, which is wider than typical gates! The spaces between the bars are only two inches wide, and hence no amateur escape artist can get away. Moreover, its pressure mounting system makes installation a breeze. This dog gate stands 31 inches tall and features 100% steel construction for optimum strength and durability. Hence, raging fur-babies trying to knock it over should be the last thing on your mind. Likewise, this product is PVC free and meets the safety standards set by the American Society for Testing and Materials. 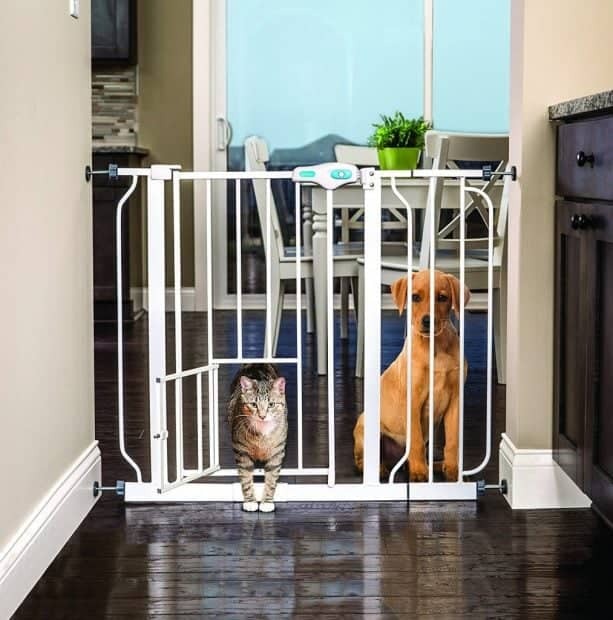 In addition, the Regalo Extra WideSpan Walk Thru Safety Gate features a lever-style handle and safety lock system, making it easy for fur-parents to walk through but impossible even for the cleverest fur-baby. Likewise, this gate is as easy to take down as it is to configure. Lightweight and portable, you can easily bring this product with you during a family trip to your vacation home. Regalo certainly has no affinity for superfluous claims or pompous talks. When they say their product is extra tall, it is indeed what they say it is. The Regalo Easy Step Extra Tall Walk Thru Gate stands a whopping 41 inches tall, which is suitable for big-boned puppies that are part-kangaroo. Such feature ensures no amateur escape artist can get away behind your back. This gate is also suitable for confining medium to large-sized adult dogs as well. Moreover, the Regalo Easy Step Extra Tall Walk Thru Gate covers any type of entryway between 29 to 34 inches wide. But with its free six-inch extension kit, this gate can expand up to 40 inches. You can always purchase separate extension kits if necessary. In addition, you don’t have to be a DIY expert to install the gate. With four adjustable pressure mounts, installation is a piece of cake. No drilling, no tools; just a sturdy gate against a beautiful wall. Similar to the previously mentioned Regalo gates, this product features 100% steel construction. Likewise, it meets the safety standards of the American Society for Testing and Materials. To open the gate, simply lift its lever-style handle and slide it back again to lock it. The Regalo Easy Step Extra Tall Walk Thru Gate is portable and lightweight, too. The Super Wide Gate & Play Yard from Regalo can be configured in ways aplenty with its eight removable 24-inch wide panels. You can add the panels to its base and create a whopping 192-inch dog fence or an excellent fireplace barrier. It is also very suitable for keeping your fur-baby on one side in an open-plan room. Likewise, you can use it as a standalone play yard to separate your tiny pooch from your grumpy cat or his bigger brothers. You can make octagonal, rectangular, or square-shaped playpens. You can even attach multiple sets if you really want to create an extra large indoor or outdoor play yard. Moreover, this gate stands 28 inches tall, which is good enough for most pups and small adult breeds. Should you wish to use this as a wall-mounted gate, you can rest assured that installation is easy and takes only a few minutes of your time. Although wall-mounting require some tools, know that mounting the gate against the wall is more preferable as it adds more security. As always, Regalo boasts of its sturdy steel construction and this model is no exception. The Regalo 192” Super Wide Gate & Play Yard also employs a walk thru design and a one-touch safety lock release lever. You don’t need to disassemble the gate to store. Just fold the fence like a squeeze-box or accordion and store it. This gate is also approved by the standards of the American Society for Testing and Materials. The Carlson Extra Wide Walk Through Gate is another excellent product to keep your dog from wandering around. 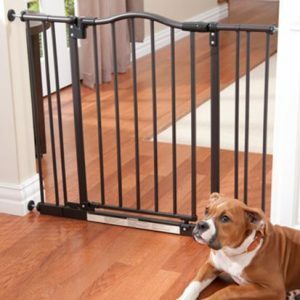 This gate is chew-proof and non-toxic, so you won’t worry about paint flakes getting ingested by your dog. As its name suggests, this gate is suitable for extra wide openings. This product comes with two extensions, so you have the option to cover any opening between 29 to 44 inches. Moreover, the Carlson Extra Wide Walk Through Gate features a durable steel construction with a powder white finish. Likewise, it is designed with a pressure mount system, which makes installation a quick and easy feat. With its walk thru design and one-touch release handle, you can pass through the gate smoothly even if your hands are full. What makes the Carlson Extra Wide Walk Through Gate unique is its patented pet door that measures 10” x 7”, allowing Tomcat to pass through while the big furry brother stays put. This is indeed a great feature but if you wish to contain a small pup, this is probably a disadvantage. Also, make sure your dog’s head will never fit into the opening especially if he tends to force himself into small passageways just to escape; otherwise, he might get stuck. 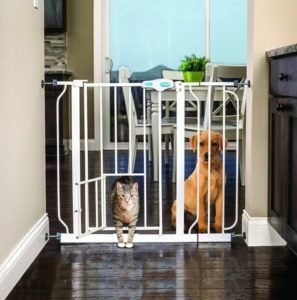 Providing your fur-baby security can be stylish with the North States Supergate Deluxe Décor Gate. While its heavy-duty metal construction is built to last, its beautiful matte bronze finish complements your ritzy décor. Who said pet-proofing your home can be so tasteless? Using pivot points on the gate panels, the Deluxe Décor Gate can be hardware mounted on both angled or straight walls. The North States Supergate Deluxe Décor Gate features a double locking system and a stay-open feature to keep the gate open when necessary. For added convenience, this gate can swivel on both sides. Plus, its arched door panel measures 25.5 inches, which is wide enough for anyone to pass through. This beautiful gate is ideal for large openings. It can fit any opening from 38 inches to 72 inches wide, and stands 30 inches tall. If you want to increase the width of this gate, you can purchase a maximum of six separate extensions and expand the gate up to 13 feet wide. An indoor dog gate is an essential tool to provide security for your dogs, especially for the new tiny growing fur-baby. You want a dog gate that you can rely on, especially for those moments when you simply cannot be near your pet. Most importantly, it allows you to curtail Doggo’s accommodations so he can’t terrorize a family get-together, and still allow him to feel he’s a big part of it. We are confident that our number one choice, which is the Regalo Easy Step Walk Thru Gate offers a safe and convenient way to fulfill such needs. This product has garnered thousands of positive reviews from satisfied dog owners across online platforms. What is more, it is approved by the American Society for Testing and Materials and thus, only promises durability and quality for your pet’s safety. 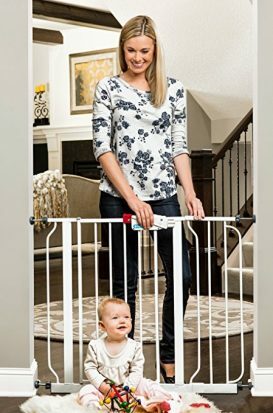 If you are confused due to the fact that these gates are also called “baby gates”, know that these gates are created both for the benefits of children and fur-babies. Besides, aren’t dogs our forever-children who just happens to have fur?